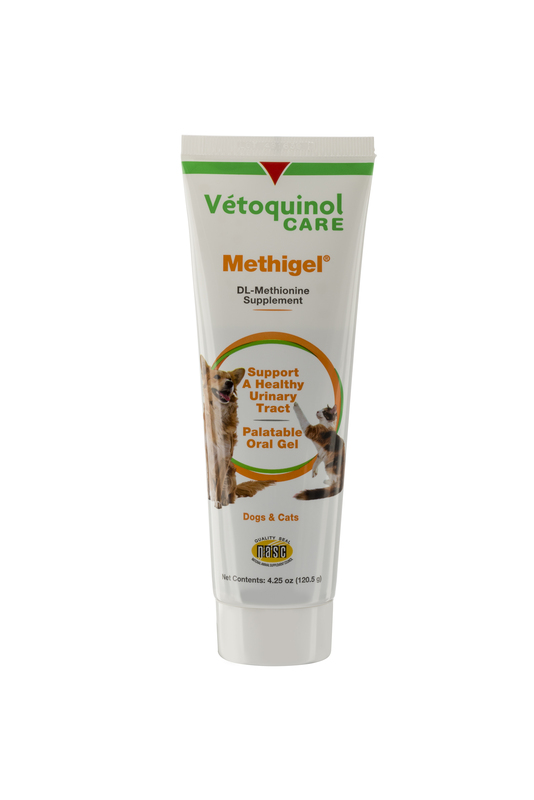 Methigel® is a supplemental source of d-L methionine acid that helps support a healthy urine pH in dogs and cats. Methigel also promotes healthy urinary tract conditions. Cane Molasses, Citric Acid, Corn Syrup, Fish Oil, Gelatin By-Products, Malt Syrup, Silicon Dioxide, Sodium Propionate (a preservative), Soybean Oil, Water, Xanthan Gum. Not for use in animals less than 1 year of age. Administer orally. Methigel® is extremely palatable. To stimulate taste interest, place a small amount of Methigel on animal's nose or directly into mouth. For Dogs: Administer 1 teaspoon daily. For Cats: Administer ½ teaspoon daily.